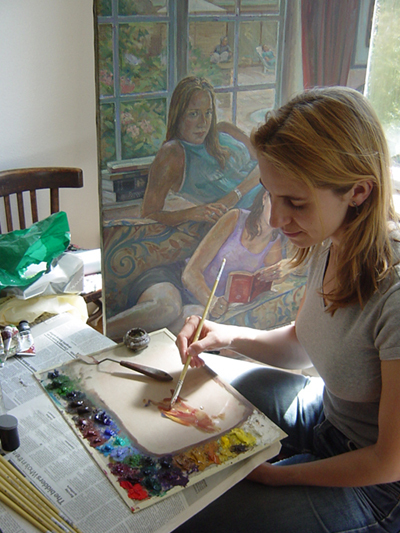 I usually follow an enquiry for a portrait commission by a discussion via email or phone about the general idea for the portrait desired. I would then arrange a meeting with the client to show a full portfolio of photographs of my paintings and to discuss ideas further. Ideas such as the inclusion of a background, lighting, clothes, formality or informality and the size of the painting. At this point a budget would be discussed; the composition and size of the painting can be tailored to suit this. The first visit is always a good opportunity to meet the sitter(s) and for them to get to know me before the painting begins. 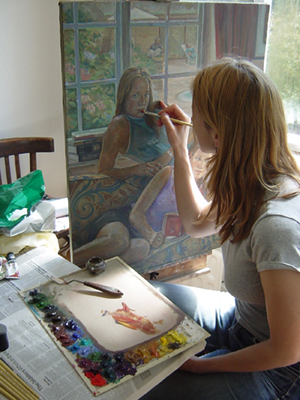 If the client knows they want to proceed with the portrait, I would take photographs of the sitter(s) in order to compose ideas before the first sitting. This composition, in the form of a rough sketch or a composite of photographs, or both, would then be sent to the client for approval. At this point, once the photography and sketches have begun, it is customary to ask for an advance of a third of the overall fee. Often, on the first sitting, I will a paint a sketch of the sitter(s) in oils on a smaller canvas. This study allows me to find the rhythms in the sitter's face in quick moving paint work and explore their subtle expressions. These canvases act as a warm up for the main painting and can be delightful items in themselves. Armed with all the relevant reference material, I would then spend time in the studio drawing up the composition of the painting and beginning to work on the background with broad paintwork ready for the next sitting. The number of sittings vary from person to person depending on how busy people are, and can span from just one sitting to many. Sittings usually last between one to two hours, with breaks, but can go on according on the sitter's comfort level and time. When the painting is finished and the client is happy, I would then invoice for the final payment.